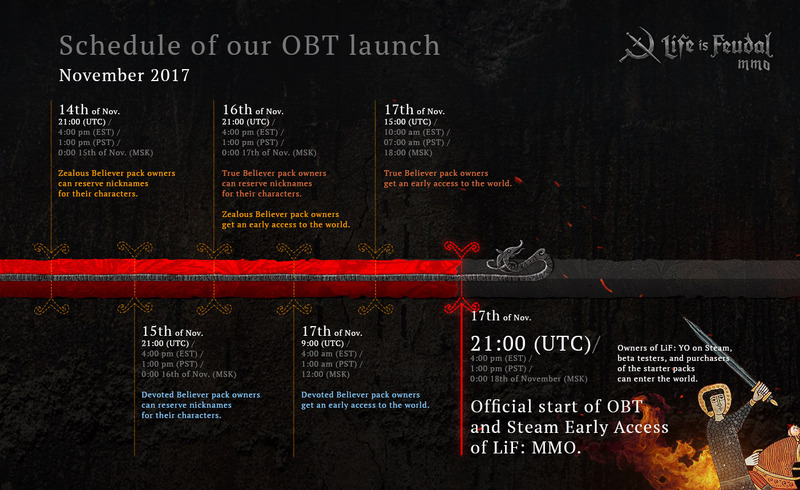 Today we would like to update you with a detailed schedule of our OBT launch. Zealous Believer pack owners can reserve nicknames for their characters. Devoted Believer pack owners can reserve nicknames for their characters. True Believer pack owners can reserve nicknames for their characters, Zealous Believer pack owners get an early access to the world. Devoted Believer pack owners get an early access to the world. True Believer pack owners get an early access to the world. Official start of OBT and Steam Early Access of LiF:MMO. Owners of LiF:YO on Steam, beta testers, and purchasers of the starter packs can enter the world. We would also like to present a short FAQ about this schedule and what you should expect during the given time frames. Q: How to reserve my nickname? Keep in mind, that reserving a nickname on EU server means that someone can still reserve the same exact nickname on the NA server. Q: What can premium pack owners do during early access period? guild monuments. Yet they can level up their skills, construct buildings (which will decay over time without claims protection), explore the world and gather resources. along with a special unique robe!